Wedding planners at Flammeum are available 24/7 via phone, Skype, WhatsApp or Viber. Each package is risk-free, because we book two wedding planners for each organized event. This package is recommended to newlyweds who are ready to single-handedly organize their own wedding in Croatia, but desire to leave the wedding day coordination to the wedding coordinator. The coordinator takes care that all of the vendors’ duties are fulfilled on time and takes care of the ceremony course and schedule. Wedding planner in Croatia takes care about all wedding details, from the beginnings of planning till the end of the ceremony. This package includes organization, coordination, design and complete realization of you wedding vision. The package is recommended to newlyweds who dream of demanding and luxurious wedding, but also to those who desire professional guidance through the every step of wedding planning. Want to escape and get married? This service is for couples who dream of a short, but romantic wedding. This kind of ceremony is ideal for all those who wish for an intimate wedding including the two of you, your closest relatives and bridesmaid and best man. Let Croatia be your elopement destination. Flammeum team is at your disposal for organizing all types of events, such as engagement, anniversary, birthday celebration, celebration of baptism etc. We will recognize your needs, offer our advices and recommendations and make your celebration unique. On a displayed pie chart you can view a wedding costs distribution. Such cost distribution is common for a wedding with 50 to 200 guests. 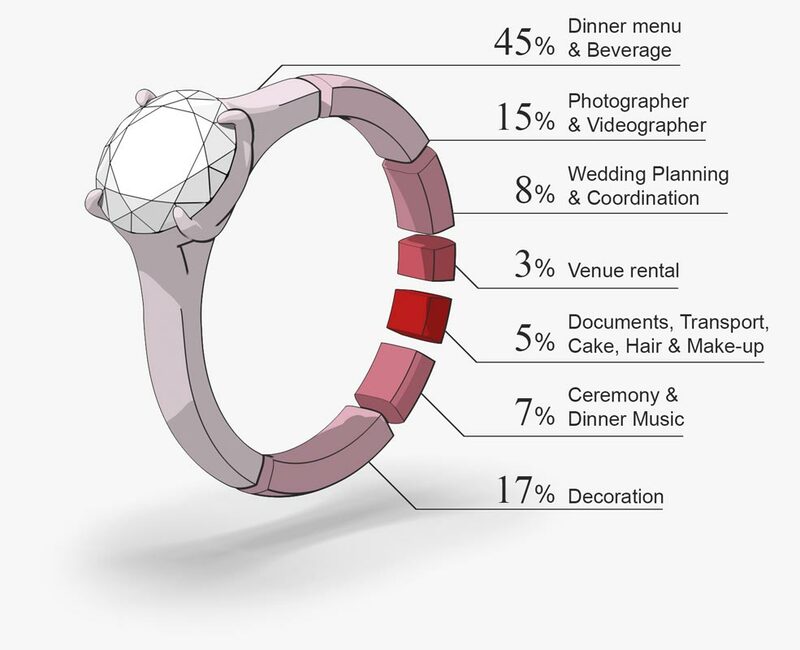 Although the wedding cost distribution is shown here, it is more complicated to determine the total wedding price. We can determine the total wedding price only after we get to know your wishes and expectations, and your budget. We tailor our venue and vendors suggestions according to your guidelines. We also prepare the approximate wedding price calculation. We include vendors that differ by price range and services they provide. Wedding planner only suggests, but you have the last word in choosing venues and vendors that suit you. It is well known that destination wedding price is usually high. But not every item has to be pricey. Wedding planners from Flammeum have great knowledge of Istrian venues and local vendors. Therefore, we can advise you about items that should not be avoided at any expense. It is not advisable to spare on food quality, music or tent. These items secure great atmosphere! We also warn you about items that could create unexpected expenses. Renting a tent and dance floor for outdoors wedding in case of bad weather, organizing transport in advance, renting additional electric generator are precautions that secure nothing disrupts the wedding. Unexpected expenses are specific to each venue and are usually not displayed in brochures. On top of that, wedding planner advises you what items could be cheaper, in order to meet your budget, while considering your preferences. Even when newlyweds from abroad hire a wedding planner from abroad, that planner usually hires a local planner to help with the organization.